I like it when pets die. I like it when my kid’s pets die. I suppose that isn’t any better. I don’t think it’s the worst thing in the world when my kid’s pets die. But I’ll clarify. Pets die. It’s an unavoidable truth of having animals come and live in your home. Another unavoidable truth is that different pets hold different values in the family structure. Put away your pitchforks pet lovers, I’ll explain. A dog. An adorable black lab who has been a loyal member of the family for the last 6 years. A cat who despite being a touch aloof, tends to sit on your lap during The Walking Dead. A parrot. Not a great conversationalist but she set you back a few hundred dollars and has a 10-decade lifespan. A pair of hamsters named after Bill S Preston Esquire and ‘Ted’ Theodore Logan. Okay. The house is burning and despite their commitment to safety, the firefighters called to save the day allow you to go in and recover one pet. How many times out of a hundred do you choose the goldfish? Zero, right? All pets are not created equal but that isn’t to say that they can’t all serve a purpose. Some pets are “teaching pets”. In our house we have an axiom we live by: Balloons and Goldfish. There are some things that just don’t last. We’ve lost an aquarium worth of fish over the years and never has a tear been shed. The girls know. Balloons and goldfish. They just don’t last. You’re right to ask. Here goes. 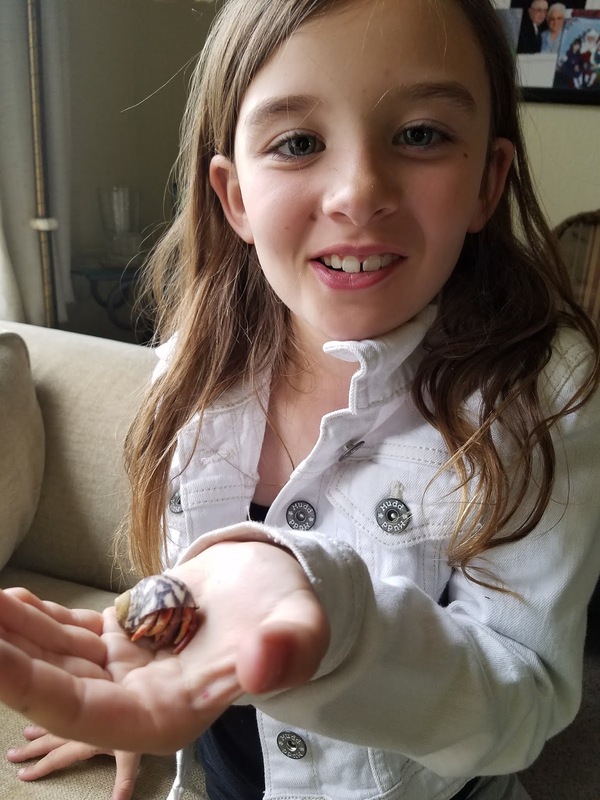 At some point over the last 48 hours one of Macy’s hermit crabs shed its mortal coil. For those who read this blog will remember this ex-crab. Two days after we adopted “The Claw” he made a heroic escape and explored our house for a week before making his way back into Macy’s room. He was a good crab because of his cool name and because of his ability to survive despite long odds. He survived a half of a year longer than he should of, but now he is no more. Macy is crushed. She loves animals and short of some off-brand guppies we had a few years ago, The Claw was the first pet that was hers alone. We had a funeral in our garden after dark last night. The Claw was lovingly placed in a sunglass case with a note from his owner and buried. Each of us said a kind word about the decapod and we went inside. Macy woke me up around 10:00 last night and wanted to talk. Honestly, she asked the questions an eight-year-old should ask. Why did it happen? Where is he now? Can I get a new one? The lesson? This one is simple. Everything dies. The thing is, dying is what makes life worth living. What would be the point in embracing the little things in life if you knew they would always be there? Losing a pet prepares you a little for the bigger hurts that will undoubtedly come as you get older. Its never easy but getting a little experience with the temporary nature of this whole experience isn’t as awful as it sounds. Getting a taste of what it feels like to lose someone when the stakes are low is good. Here is where it comes full circle, all pets serve a purpose, if only to be buried in a backyard garden and have kind words said. Macy, I hate seeing you hurt and if I could bring back “The Claw” I would, but I am comforted in knowing that the little crustacean that lived in your room has helped teach you a little about death, and that, little girl, is important, too. I don't want any of the three of you to know the ins and outs of death, but a little grasp of it is useful. Heck, your old man won't be around for ever. So, assuming all goes as planned, you girls will be sneaking my ashes into Coors Field or taking them on a scuba trip and I can’t have any of you panicking!